Please, do not purchase goat milk soap…unless you try handcrafted goat milk soap first! Have you ever tried handcrafted goat milk soap? If you have, you know the luxury of a good bar of soap. 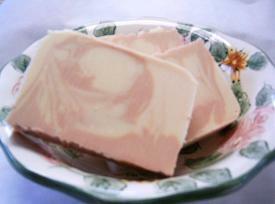 Goat milk soap is gentle, with a soft silky lather that pampers the skin. There are a lot of goat milk soaps on the market. Try going a Google search. You will find an amazing number of goat milk soap makers! What I have found, however, by trying the soap myself, is that some larger producers sell goat milk soap that has more of a processed feel than the average handcrafted bar of goat milk soap. I am not into knocking competition. In fact, I love seeing the varieties of soaps, creams, scrubs, and other cosmetic products! Most soapers are very much protective of their own product. There isn’t one I do not want to see succeed. Soap crafters seek and expect good results! They make their products gingerly, in small batches, using the utmost care. I support small business, especially the soap and cosmetic businesses! The only thing I ask is…when you purchase soap, spend your money carefully. Watch the mass-produced cosmetic companies that stake a claim on goat milk soap. In my humble opinion, their soap is simply not the same. I am jumping off my soap box again (for now)! on January 20, 2010 at 2:34 am | Reply KathyB. I just read this post along with your last post, and as always I find inspiration. I have actually begun to re-organize my goals for this year. I have learned a lot from selling my products at bazaars and listening to what my customers and possible customers say they want…. It is a good thing for you to get up on your soapbox Mary! This is one of those topics where a business owner wonders, “Do I say it? Or is it tacky?” It is something that needs to be said, in my mind, but saying it with conviction, without it being misunderstood takes careful treading. I get on my soapbox now and then, because I do have things to say. It is a good thing, Kathy. Thank you for your insightful comments. Many people don’t realize there’s a difference… many people don’t consider things until the ideas are planted in their heads in the first place. It’s one thing to be pushy, but an entirely different matter to bring information to the table and allow people to make their own choices once the information is presented. This isn’t a bad thing… it’s informational, useful, and these kinds of things need to be said. There is a place for it! Hope you are having a fabulous day (okay, evening!) !!!!! I have not watched Food, Inc. . You said “watched,” is it a television show or a network? Lynnanne, useful and informational, and interesting (I hope). I see…said the blind man! Anything made with pure ingredients is always better than anything manufactured. They always take shortcuts and put in ingredients that are not so good for your body. I once heard not to put anything on your skin (the body’s largest organ) that you wouldn’t put in your mouth. When I first heard that statement, the skin is the largest organ of the body, I touted it. No touting to it…it is the largest organ of the body. I add man-made colorants and fragrances, but at a minimum, and honestly, if it were all up to my own tastes, everything would be made all natural (no colorants, essential oils only). But, I am about making products for people that puts a smile on their face, and for those that want natural or nearly natural. What they want is what I produce. And I do it with safety in mind.